We’ve long been aware of the emergence of curved and flexible display technologies, with the threat of companies actually implementing them being exactly that – a threat. Now, Samsung has actually crossed the proverbial line with the Galaxy Round, a phablet that’s set to hit SK Telecom in South Korea as soon as this week. What is it, you ask? The best way to describe things is by saying it’s a Note 3 that got into a fight and ended up far from deflated, with a crazy concave curve running across the screen from left to right. Aside from the reduced battery capacity (3200mAh -> 2800mAh), absence of S Pen and Wacom digitizer and reduced mass (now at 154g, probably due to the missing components) this thing is just a glorified and insane Note 3, and lucky Koreans will be able to step into a curvy future with the Luxury Brown model for just $1000. You really do get what you pay for. Over the past couple of days, I’ve seen numerous sites pick up on the story spread by a Carphone Warehouse press release that interest for Samsung’s new Galaxy S4 is so high that pre-registrations for it are 446% higher than with last year’s Galaxy S III. Many blogs, most notably VentureBeat and Pocket-lint, have sprung upon the opportunity to say that this is a sign that Apple is dying and Samsung is king and all that regurgitated nonsense, but they fail to point out any facts in these articles. The big one that is being ignored is that you can’t even pre-order the phone yet at Carphone Warehouse. The press release in question, published below, refers to pre-registrations, not pre-orders. With Samsung yet to confirm pricing for the phone, no retailer worth their bacon should be letting consumers order it yet, with Carphone Warehouse cleverly taking £29 deposits from interested parties or, for those less inclined to splash their cash, and crucially what they are most likely referring to when they give this figure of interest, email updates. Even if they were referring to deposits, these figures should be taken with a pinch of salt, and you should not trust any figures you see regarding the popularity and sales of the S4 until Samsung themselves give solid evidence. Graham Stapleton, Chief Operating Officer at Carphone Warehouse, says, “The Samsung Galaxy S4 is huge news for anyone who already uses or is interested in getting a smartphone. “Samsung has the timing spot-on with a late April launch, 4G coming to more UK networks this summer means that interest in new devices will be building considerably. We’re anticipating a massive amount of customer interest in this handset and are expecting our stores to be busier than at the height of the Christmas period. We are planning to extend opening hours at our larger sites to cope with the increased demand. 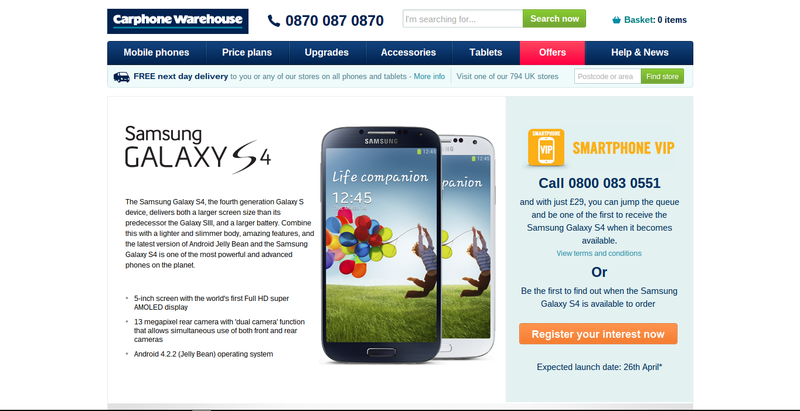 The Samsung Galaxy S4 will be available from Carphone Warehouse on all major networks from 25th April. To register your interest, visit http://www.carphonewarehouse.com/new-samsung-galaxy-phone. Samsung Galaxy S4 launch event coverage: tune in tomorrow for a special podcast! Samsung’s definitely launching the next Galaxy flagship tonight with an octa-core Exynos processor, 1080p display and automatic eye-tracking scrolling expected to debut at the New York launch event. The event starts at 7pm ET/11pm GMT, which is sadly not convenient for us to cover live on the site. As such, we’re planning a special edition podcast tomorrow afternoon with myself, Henry, Chris and Rowan all arguing about whether it’s the next Android phone worth your money. Join us for that tomorrow evening, but until then have a good night and enjoy the show! We’ve known about its impending arrival for a while, but only now has an Engadget tipster shown us what Samsung’s latest Galaxy Note form factor will look like. Following on from both of the phablets and the 10.1″ slate we saw at MWC a year ago, the new 8″ tablet appears to aim squarely (or rectangularly) at the Nexus 7 and other small slates, and, unsurprisingly given its Galaxy Note nomenclature, there’s an S Pen involved. The design language appears to closely follow that of the Galaxy S III and Note II, and we should get to see more of the device, set to be the main inspiration for the upcoming Galaxy S IV, at MWC in Barcelona this week. Samsung has announced an event scheduled to take place on May 3rd in London, where it is widely speculated that the Galaxy S III will make its debut. 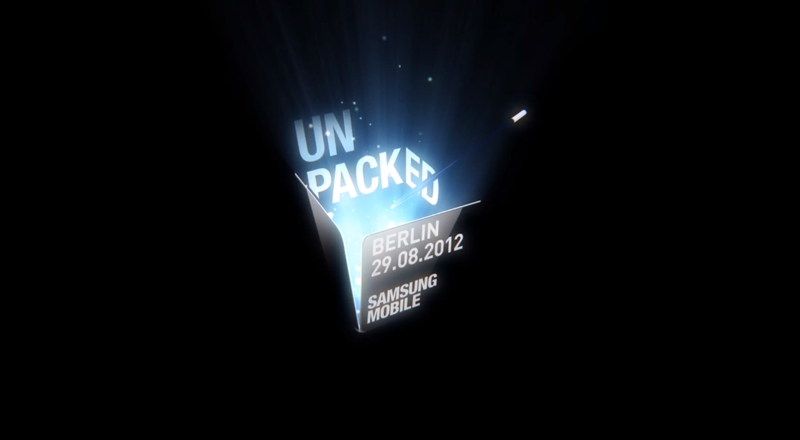 The official invite, pictured above, states that visitors will be able to meet the new Galaxy, but the question remains as to where this new device will fit into Samsung’s Android lineup. The Galaxy S III is rumoured to come with a quad-core Exynos chipset with integrated support for 4G LTE networks, similar to that found in the refreshed Meizu MX, support for the S Pen that comes with the Galaxy Note range and a 4.65″ Super AMOLED Plus display of 1280 x 720 resolution. The ‘Plus’ denotes that the display would have a standard RGB subpixel arrangement, compared to the Pentile RGBG layout on devices such as Samsung’s own Galaxy Nexus. As with any major event invite, Samsung’s invitation has set the theorists into action, with some suggesting that the blobs of liquid refer to a curvaceous design or display, while the brushed blue surface could be code for a colourful brushed metal finish. Vlad Savov of The Verge even came across a Korean commercial for the Galaxy Note, which you can see below, in which the protagonist excitedly makes an appointment for May 3rd, and the numbers 5 and 3 flash around quite a bit, although this could be just a simple reference to the 5.3″ Super AMOLED display on the device that has pioneered the phablet industry. What do you expect from the event? Let us know in the comments below, and be sure to check back on the day to get the news fresh from London.